When is a comic not a comic? 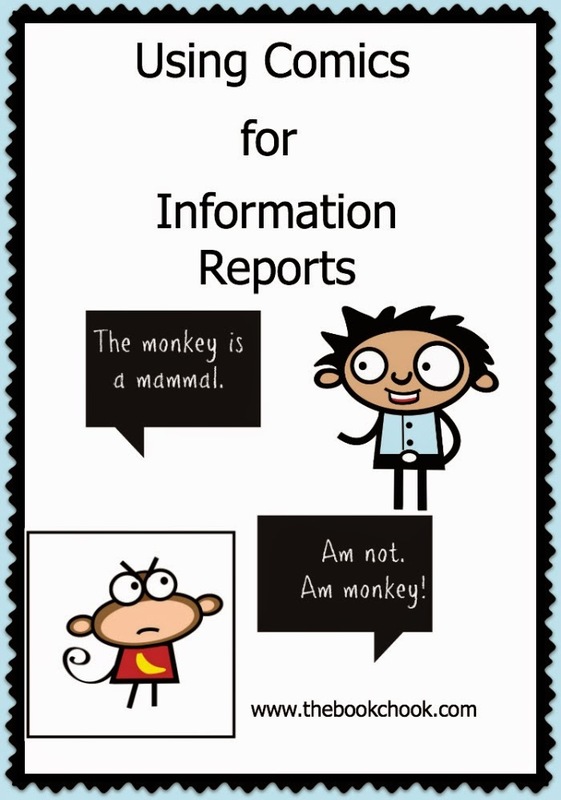 When it’s an information report! Comics have had bad press, little of it deserved in my opinion. If you’re a long-time reader of The Book Chook, you’re probably aware of the fact I think comics are a great way to lure reluctant readers and writers into trying reading and writing. Here are some ideas on how to use that comic style (images and captions/speech bubbles) to present information. *Children for whom writing is a chore may find telling a story with captions or speech bubbles much more achievable. Kids who love drawing will readily embrace drawing their own illustrations. For others, a camera makes a great alternative. Children can set up scenes and photograph them for later adding to a template via software. The addition of captions and speech bubbles complements the message the images give. Narrative like this flows on into something more factual - an information report. In some respects, it’s still a story, but it’s a fact-based one. Kids can research information about a topic like Australian animals, then choose the most important information to present in comic format. *When you’re looking for a way to give feedback to your local or school community on a special day or an excursion, the comic format is a succinct way to communicate with images and words. Kids love to take candid snaps and add captions and speech bubbles to photos too. *With younger children, a collaborative creation of a report works well. Once images have been sourced, class members can suggest what captions and speech bubbles should say. *Kids are motivated to report on books they’ve read when they use a combination of images and words in the comic format. *The comic template is a format that scaffolds students who need help. It nudges them towards thinking about WHAT they want to communicate and HOW they will do that. Having a template of restricted panels, e.g. 4, means kids perceive their task as far more achievable than an essay or traditional information report. Please note: I’m not saying here that children don’t need to learn to write in paragraphs. I’m saying that for some kids, and many kids at some times, a comic can be a great way to present information. Comics really help children hone in on what is essential to communicate, a “tight writing” skill that is very handy to have. *Because comics rely heavily on images, they can be an excellent choice in Science to explain a process or show a change e.g. a seed growing over time. Children can set up experiments and record their observations in words and images, then condense that information to relay it quickly to an audience. *CC licensed images or ones in the public domain can be utilised by kids to report on history and geography topics. Otherwise they can draw/paint, and those illustrations can be scanned and added to software. One of my favourite ways for kids to create comics is via software called Comic Life. I’ve used it recently in Children’s Book Review and Activities, Jeremy, plus in the model of a comic-style information report I'm sharing today. Comic Life is available for Mac and Windows, and it’s super easy to add and edit all sorts of images - perhaps ones the kids have drawn themselves, free CC licensed clipart, photos the kids have found online that are CC licensed, or photos the children have taken with a camera of some kind. Kids can create comics with apps, too. Apps that you might like to try are Photo Comic, (iTunes, Google) Pic Collage (my review), Strip Designer (my review). Have kids get that comic “look” with apps/filters like Paper Camera, and ToonPaint. Add a multimedia dimension by using apps like Shadow Puppet, or 30 Hands to stitch images together to make a video, and add audio too. You might also like to read Telling Stories with iPad Apps ToonPaint and StripDesigner. Kids can start with the actual PDF. I’ve written text for the first panel. 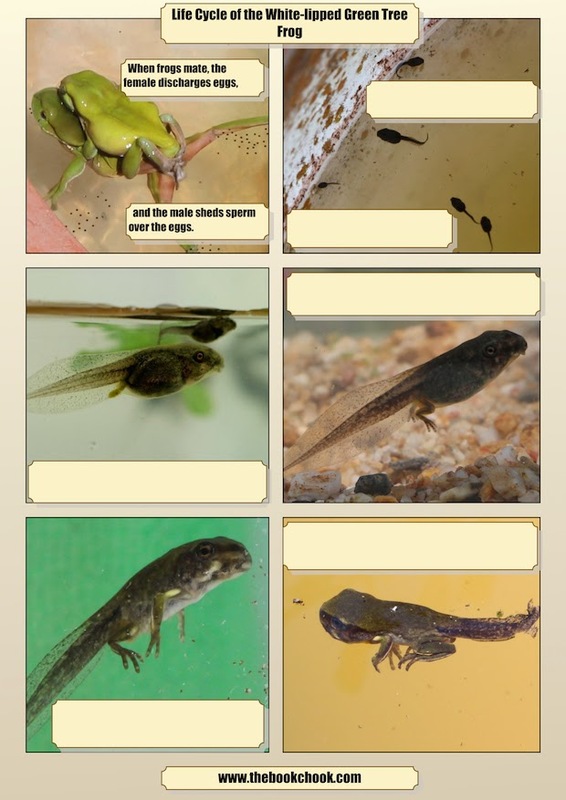 Children can add their own text to the blank boxes to explain the life cycle changes in the other pictures. Have them add numbers to show the progression - it’s pretty much left to right and top to bottom, but some kids might not realise this. Better still, set up a camera if you are near a frog pond and take your own snaps. This is a great project for Springtime - and it’s almost Spring in Australia - YAY! If you have a small aquarium or pond, be sure to keep water clean. For these tadpoles, their favourite food was boiled bok choy. Get more information at Frog Safe. +Deb Arcaro has some picture book suggestions for a froggy theme, and a neat craft activity. She has heaps more great ideas on her Pinterest board. While engaging in all these activities, kids are collaborating with others, thinking both critically and creatively, and publishing their work to a wider audience. The bonus is, they’re having fun! Susan, First thank you for the mention and link up. I'll be adding this frog PDF to my materials. Will also be looking into some of the comic apps you've mentioned here. Seeing possibilities for even my young learners to use. I think sharing the writing process with youngsters is valuable at that age too, Deb. Thought they might enjoy pondering the changes from egg to frog in the great photos!